SOFCs offer high electrical efficiency and are well suited to static power generation. Progress towards commercialisation is being made. SOFCs offer good fuel flexibility and can run on fuels such natural gas, biogas, and coal gas as well as hydrogen. Solid Oxide Electrolysis Cells (SOECs) are closely related to SOFCs, and offer high efficiency hydrogen (and potentially syngas via CO2 and steam electrolysis) production, utilising thermal energy to reduce electrical demand. Research challenges for SOFCs and SOECs relate to cost, durability, understanding and optimisation of interfaces, performance, and sustainability of materials. 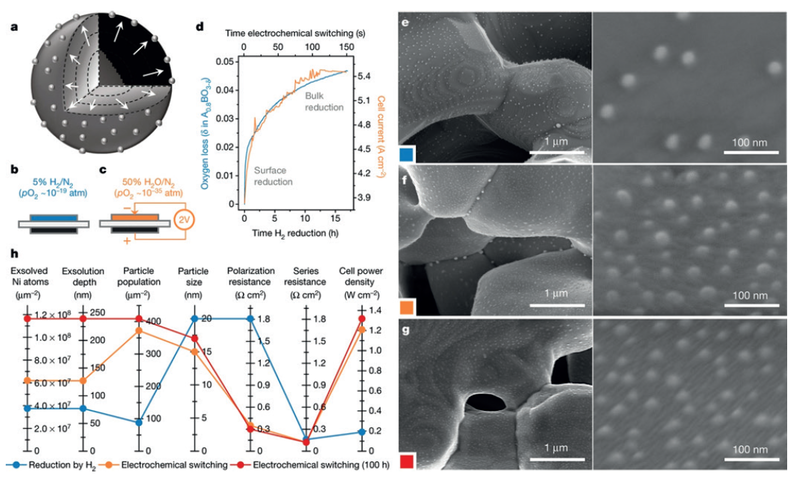 New research areas utilising oxycarbides as base structures to develop new fuel cell electrode materials utilising non-critical elements have been developed. New technology solutions seeking to implement fuel cells in ships, domestic CHP and golf vehicles as background technology enabling approaches are also being developed. a, In redox exsolution: an embedded metal and is exsolved from the lattice onto the surface upon reduction. b, c, Conditions used to trigger exsolution in a Solid Oxide Cell at the fuel electrode, reduction in 5% H2/N2 or c, electrochemical switching by applying 2 V. d, In blue, thermogravimetric data showing oxygen loss upon reduction by hydrogen as a function of time. In orange, cell current upon application of 2 V, also as a function of time. e, f, SEM micrographs of La0.43Ca0.37Ni0.06Ti0.94O 3- electrodes produced by: e, reduction by hydrogen at 900 °C for 20 hours; and f, electrochemical switching, under 50% H2O/N2 at 900 °C for 150 seconds. g, after further 100 hours of fuel-cell testing at 750 °C in 3% H2O/H2 at 0.7 V. h, Various characteristics of the samples shown in e–g. Polarization and series resistances are given at open-circuit voltage. Reproduced by permission from J-H. Myung, D. Neagu, D.N. Miller & JTS. Irvine, Nature, 2016. 537, 528–531. The objective of this project is to develop and demonstrate solution methods for introducing the active constituents into SOFCs. If successful, the new approach could be applied to the manufacture of fuel cells that combine high performance with durability and resistance to contaminants. Methodologies will be developed to tailor impregnations over a broad range of composition space. Studies utilising electrochemical, spectroscopic and microstructural techniques will be used to test performance, durability and resistance to contaminants, thus informing a choice of impregnate systems. For a detailed presentation on the project, click through here. Determine surface chemistry of air-electrode environment interfaces under operating conditions (in operando). Relate catalytic activity to surface structure and cation segregation effects. Probe strain and structure at buried interfaces (electrolyte/electrode). Design and manufacture electrode structures with 2D and/or 3D engineered interfaces. The electrode, and the electrolyte-electrode interface, play a critical role in the performance of all cells. In Solid Oxide Fuel Cells (SOFCs) the microstructures of the porous composite anode and cathode are particularly critical, as they determine the electrochemical, electrical, mechanical and transport properties of the electrode, and of current distribution to/from the electrode/electrolyte interface. Current state of the art SOFC electrodes rely on a largely empirical understanding to establish the electrode microstructure. Our prior work has established a new suite of tools and techniques that offer the prospect of moving towards a design-led approach to manufacture of improved electrodes, based on our ability to image, model, simulate and fabricate new electrode structures with controlled properties. This proposal seeks to develop and further demonstrate our analysis and modelling tools; using design optimum structures fabricated with three novel processing techniques established by the academic team, and then measuring device performance to feedback into the design process. This proposal seeks to develop two novel diagnostic techniques, pioneered by UK researchers, and apply them to advanced cell testing and characterisation in conjunction with partners in South Korea. The measurements are used to validate models developed in the UK to relate the measured data to degradation and failure modes, transferring this to South Korean partners to offer the potential for real time monitoring and control of SOFC stacks. This will give valuable understanding required to refine and develop the next generation of SOFC systems in the most time efficient manner, and have wider impact on UK and other international developers. The programme will also support an exchange of researchers between the UK and South Korea. The aim of this proposal is to demonstrate the capacity of direct flame solid oxide fuel cells (DFFCs) to extract electricity directly from natural gas and liquid petroleum gas (LPG) flames. We will demonstrate DFFCs which can be directly put in the flame of a burner/cooker to generate electricity with the application of advanced materials. The novelty of these DFFCs lies in optimising the flame positioning and the use of a redox stable cathode to improve the durability during redox and thermal cycling. Sealing is not required and DFFCs are relatively safe. This project will be investigating the use of exsolution decorated, electronically conductive, perovskite materials to produce alkaline fuel cell (AFC) electrode structures. It is hoped these structures will display enhanced activity, improved startup characteristics, and improved cycling and steady state durability. Work has been completed at St Andrews developing and tailoring methods for generating high surface area powders with large numbers of active exsolutions of candidate electrocatalyst. This has been complemented by electrode development and testing at Lancaster University. This project sought to apply 3D imaging and modelling methods to develop a design tool that would support the design of current collectors for SOFC electrodes. The result was the development and demonstration of a new methodology to understand how porous ceramic materials respond to point loads. This was validated against 3D imaging and nano-indentation experiments on SOFC cathodes. This project will examine dimensional change at the electrode, electrolyte, gas diffusion layer, cell and stack level. The project has delivered a controlled compression stack assembly that can be used by commercial stacks. The use of X-ray computed tomography has been demonstrated for examining the deformation of the fibres in gas diffusion layers when put under compression, while the quartz crystal microbalance was used to probe water uptake dynamics and associated membrane dimensional change. Ongoing work is being undertaken to use neutron imaging to understand the role of water in determining dimensional change in components, and to use electrochemical atomic force microscopy to examine the effect of dimensional change induced by ionomer swelling in electrodes. An extensive presentation on the project’s progress can be found here.